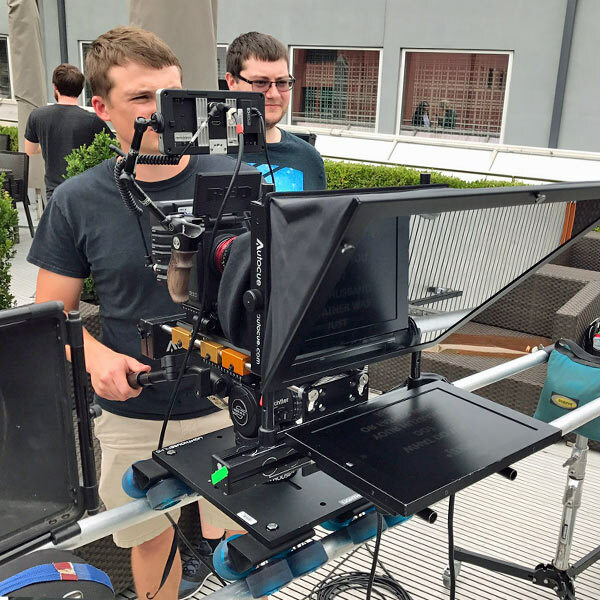 Price: $945 for 10 Hour Day with OperatorThe Interrotron Mark III includes a camera, lens and talent unit.To find out more about the Interrotron, click here. Price: $250 Per Day; $750 Per 3 Day Week For further information on extended rental packages please call:Bill at 917-414-5489 or Jocelyn at 646-617-6535 Available for in office pickup or shipping. To learn more about the EyeDirect, click here. Price: $945 per 10 Hour day with operator. Price: $745 per 10 Hour Day with operator.2x 19″ Monitors or 1x 32″/36″ MonitorPlease note: Monitors over 32″ are subject to price changesAdditional monitors and sizes are available. To discuss these and other unique setups, please call:Bill – 917-414-5489 or Jocelyn – 646-617-6535Click here for our confidence monitor page for more information as as well as images of the units. Price: $95/Day without iPad; $120/Day with iPad (Stand not included)Available for in office pickup or shipping. To get more info on the EyePrompt, please click here. $945 with high bright monitors. Pictured on the left is our pristine Atlanta office. Trust me, it’s not always like this! Add people coming and going. Mix in equipment in and out of boxes and at lunch time take-out food everywhere. Each person accepts the responsibility to clean up afterwards.Our staff is well organized and is great at multi-tasking. Phone calls are answered as they ring. We really appreciate our clients. Anna was raised in Grand Island Nebraska. She graduated Northwestern with an MFA in Dramatic Arts and a minor in English Lit. Anna worked in New York as a spokesmodel and acting coach. She is now our teleprompter speech coach in Atlanta. She loves to travel. 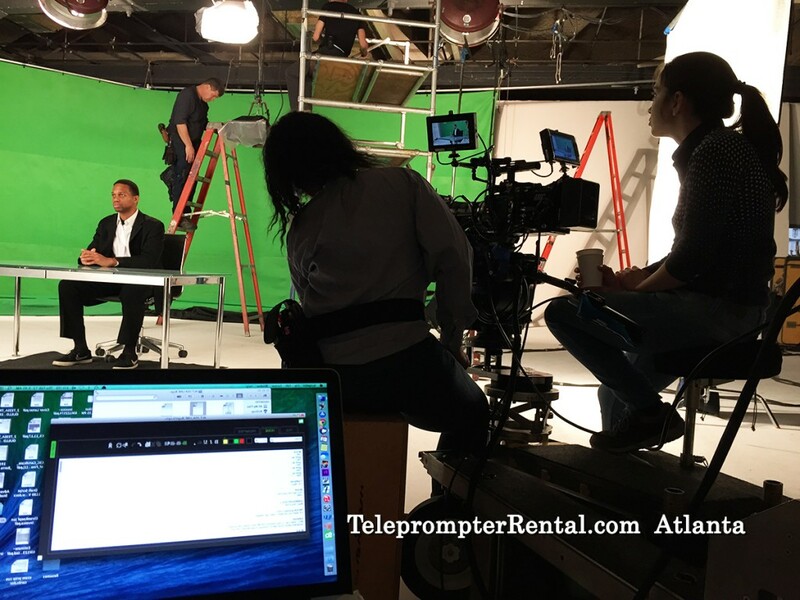 She will work closely with your talent and help them give a relaxed, confident and highly persuasive performance before the teleprompter. Anna lives in a small apartment. One of her best friends has lots of space. 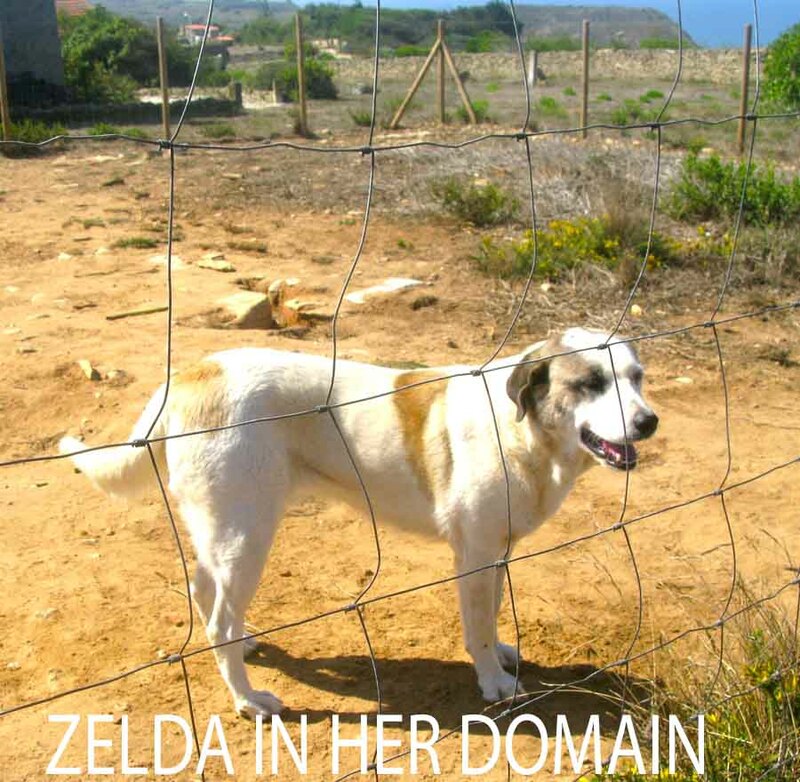 Pictured below is Zelda, in her European digs. If work continues to go well, a visit in the summer would be welcome! I moved to Atlanta, Georgia about three years ago. I had been attempting to support myself as a stand- up comedian in the Big Apple. I gave it the old college try anyway, even though I had an aversion to higher education. I was one of those that always felt street smarts would far outweigh book smarts. I had been warned that “the business” was rough but I wasn’t quite prepared for the circus that lay ahead. Literally. The closest thing to funny that I became was working a birthday party for a has-been actress’s bratty, four-year-old niece. I was a clown among clowns. Literally. Eventually, the party became tolerable when I befriended the caterer and he kept an endless supply of Tanqueray and Tonic coming my way. The only thing that was missing was a lime wedge and the fragmented remnants of my self-esteem.I met a boy that summer. He was working at one of those bus tours in Times Square that go to all of the celebrity houses. Basically, he was a paid stalker. But his genuine enthusiasm and love of the grape drew me in. We’ve been an item ever since. Cheers. He was born and raised in Atlanta. He worked at the Underground growing up and when his parents divorced he moved to Buck Head. He and his older brother moved out on the promise of building a snow-cone empire with a group of guys that his brother knew that just moved from New Jersey.When his mother fell ill he moved back to Atlanta and I was happy to follow. It ended up that his half-sister, boyfriend’s cousin, Angela was working downtown in an office that represented and worked with various artists ranging from voiceover work, acting, improvisation, and speech coaching. They had a whole room of pricy teleprompters that looked like aliens and transformers had love children. 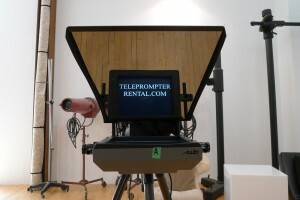 So, one day after filling my vegetarian belly full of baby, chicken wings at JR’s, I got the call that I had been officially hired as the new receptionist at Teleprompter Rental. This clown was now raking in above minimum wage and became a local force to be reckoned with.It’s hard to believe that I’ve been at the same job ever since. I’ve worked my way up and go out on gigs. I am so happy to have met the people that have come in and out of this wonderful office. All are passing ships in the night for different reasons. Clients by nature are temporary. Jose and Lucia got married, while Carlos and Andrea had their second child. We all came to mourn, Big Harry, the old janitor whose presence here spanned countless and colorful lifetimes, as it were. I continue to enjoy meeting people. I may not be a standup comedian, but I’ve learned the value in being a stand-up citizen. And hey, if I happen to make someone laugh along the way, then this is a life worth living. Sam Morrison is a self-proclaimed kombucha enthusiast and the manager of American Movie Company’s Atlanta branch. After graduating from NYU with a degree in acting, Sam decided to move back to his hometown. Together Sam and the office dog, Alfie, work to maintain equipment and operations in the city. They love hitting up local spots in their free time, and can often be found at the local PetSmart purchasing toys for Alfie. Cheryl Copolla began her career in film after leaving the accounting world about 4 years ago. 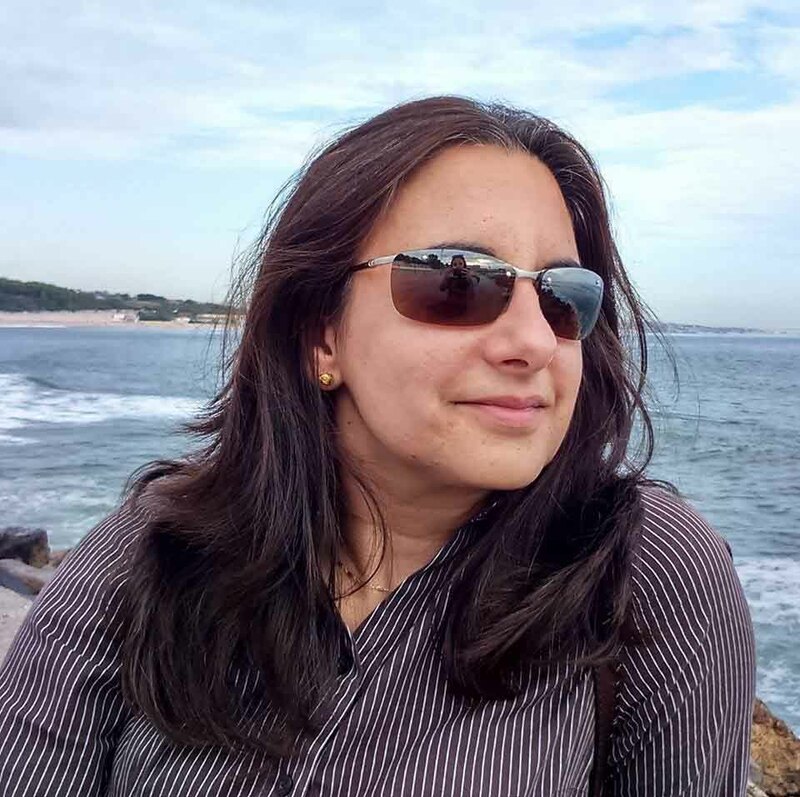 She has aided in the production of over 7 feature films and has traveled across the nation filming short documentaries of her own. When she’s not on set, she likes to volunteer at the local animal shelter. She spends her free time watching documentaries on Netflix and going to the gym. Cheryl’s other hobbies include painting, cooking, learning new languages and interior design. Please call above number 24/7 for more information and to discuss your project with Bill Milling. Our presence in Atlanta is at long last a reality! We have had several teleprompter gigs in this most wonderful of cities. Its attractions are too numerous to mention. High on the list, of course, are the many museums, the urban oasis that is the Atlanta Botanical Garden, the History Center, which houses the largest Civil War memorabilia in this part of the country, the Centennial Olympic Park (Olympics held here in 1996). Of note is the largest aquarium in North America, the Georgia Aquarium. Let us not forget you can take a hike in Stone Mountain Park, the most visited attraction in the state.Perhaps, the MLK JR National Historic Site can be said to be the most important site in Atlanta. Given that it is home to the Civil Rights movement, other attractions relate to exhibits which depict defining moments in Martin Luther King, Jr’s life. One cannot pass up visiting the Ebenezer Baptist Church. Its importance is indisputable. Sorry, I seem to be giving you a history lesson. I didn’t mean to preach. It is fresh in my mind because we attended a celebration in honor of MLK’s birthday this past January. The use of the teleprompter by various speakers ensured a flawless delivery. 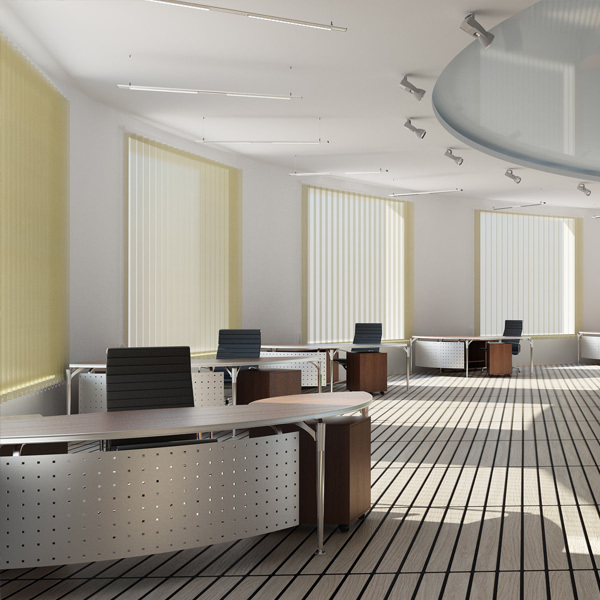 Rest assured, when you rent from us, we will do our best to make your project run smoothly. We pride ourselves on being the best!Take the worry out of your next speech delivery – give us a chance to work with you. 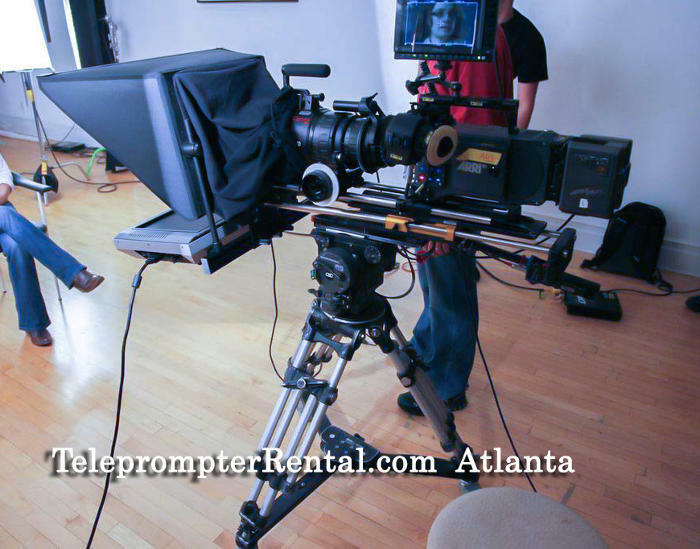 Eva is one of our prompter and Interrotron operators here in Atlanta.We will deliver and operate a Professional Teleprompter, Presidential Teleprompter, Interrotron or Confidence Monitor.Our prices are all-inclusive in the Atlanta area.